A cake in a day. Sometime at the end of November I bought this. 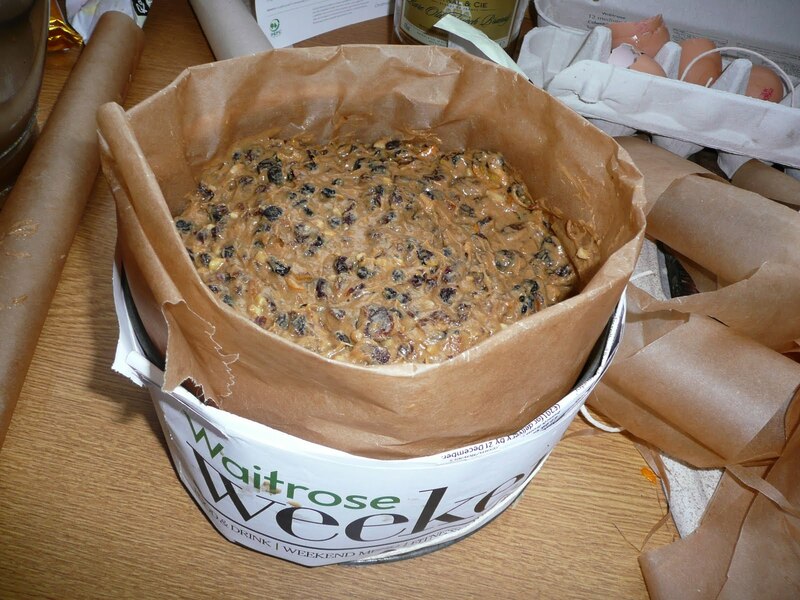 Yep, one of Delia’s Christmas Cake packs from Waitrose. 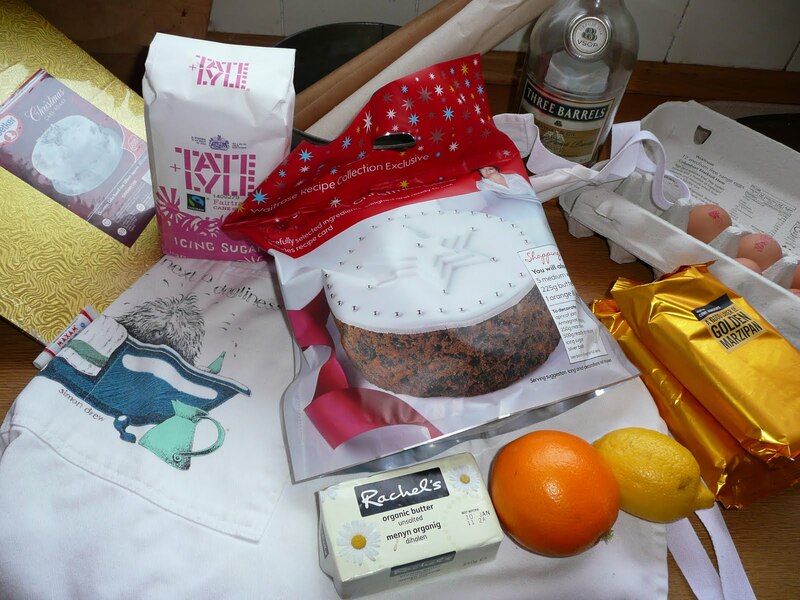 I was quite giddy about it as I have been making Delia’s Christmas Cake recipe for 23?! years. So I popped it in my basket, told some of my friends how wonderful it would be not to chase around for ingredients and promptly forgot about it. That is, until last week. When I realised that I would still need to do a certain amount of coordinating of ingredients. I say coordinating of ingredients rather than shopping because son no.2 is home from Uni and it is incredibly difficult to save five eggs. I have been shopping for eggs three times in the last week. Even to the point that as he went out sledging this morning, I asked him if he had had something to eat and his reply was a casual “oh yes, I’ve had some eggs”, just as the front door closed behind him. I rushed to the kitchen and I could feel the beads of sweat beginning to form on my forehead and a rather colourful expletive was on the tip of my tongue, but fortunately he hadn’t cleaned me out. 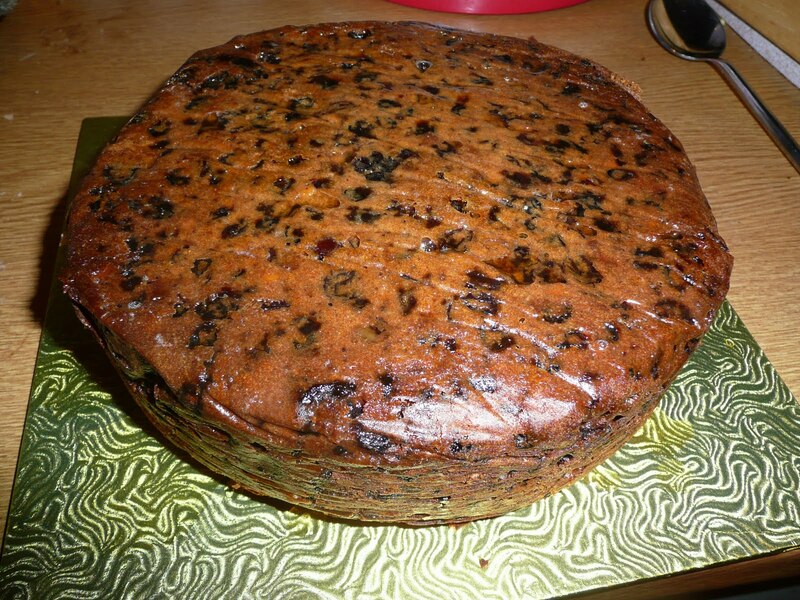 I must also say thank you to Diane, who could see that I was flailing at having to make the Christmas cake because I’ve been fighting off a persistent little virus for the last two weeks. I begged her to remind me to make the cake and true to her word she messaged me yesterday to ask if I’d made it. It was just the mental jog that I needed. That and that the kitchen had warmed up slightly, I think the fridge was warmer than our kitchen at one stage. 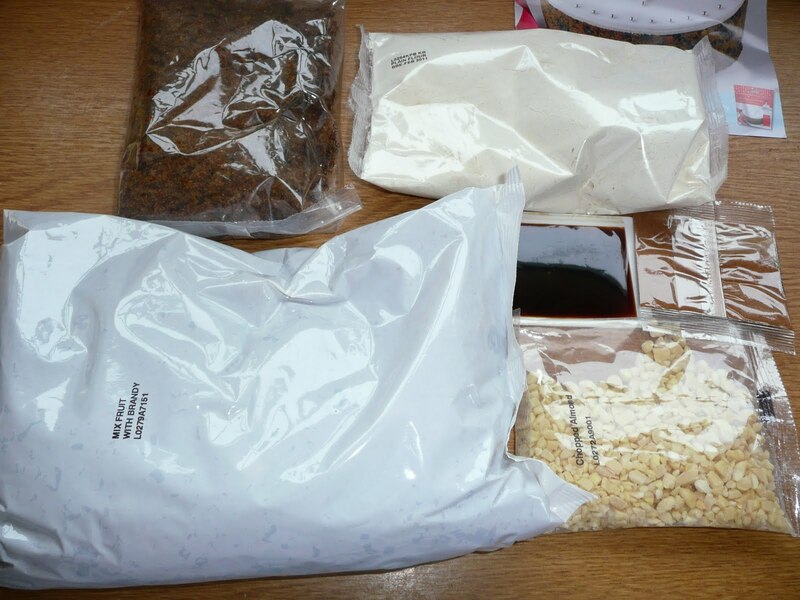 So this is what the kit looks like. I put the black treacle in a mug of hot water to warm up to make it easier to pour out. I liked the idea of the kit, I really liked it, but, my nuts would have been more chunky as would my glace cherries. And, I realise just how much I add a few more nuts or just a few more cherries, maybe an extra splash of brandy. But I stayed true to the package! I mixed up the cake with the help of the ancient Kenwood and King’s College Choir singing carols in the background. And soon we had this, I couldn’t find my brown paper so newspaper was the next best thing to insulate my tin with. Four and a quarter hours later on a very low light, we had this. 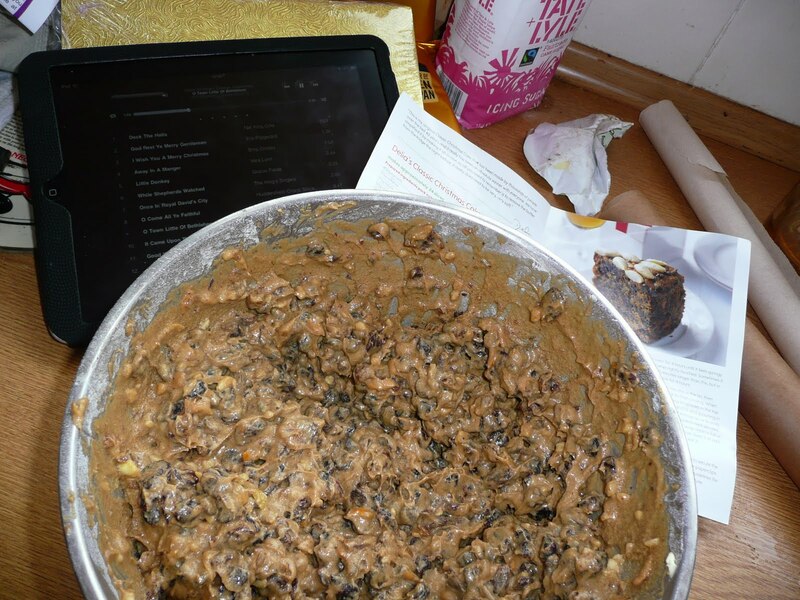 Which smelt lovely, it was allowed to cool for a few hours with intermittent splashes of brandy poured over it – I actually finished the bottle so it had a couple more tablespoons than I would otherwise have given it. Hubby helped to roll out the Marzipan whilst I brushed the apricot jam on. 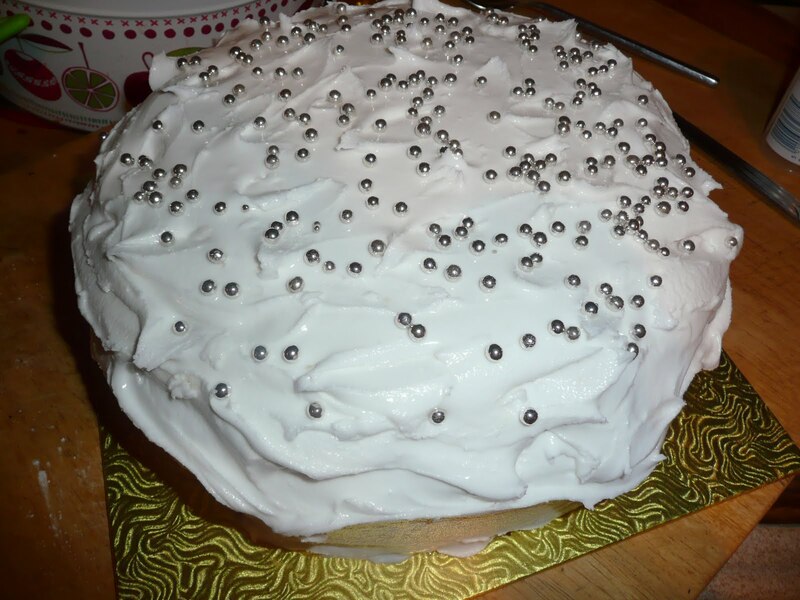 Then strewed a few silver balls over and the cake was finished. Thank you, you know who you are…. Secret Santa at the Knitting group. 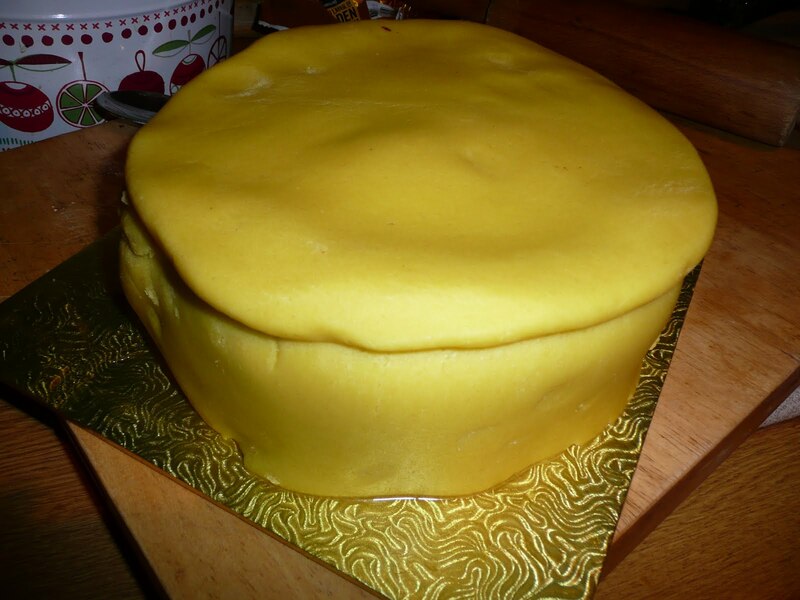 I love your cake and the way it looks fully iced! I haven't seen this type of icing since I left England and remember making it at school in Domestic Science class ( do they still have those classes?) 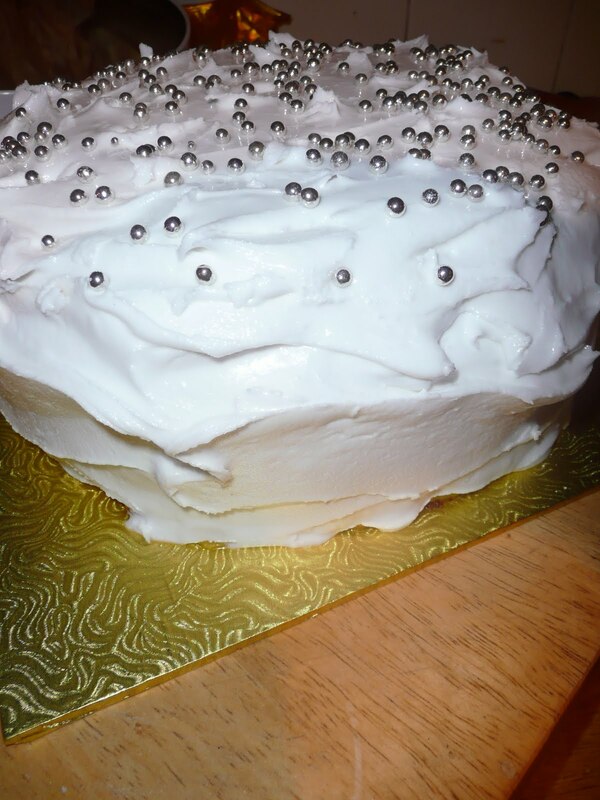 It was called Royal icing then and I'd love to make it again but never have.